The dealer in Multi-Hand Blackjack will always stand on 17. You can split once, but you can never re-split. Split aces receive one card only. Blackjack is only possible on your first two cards (not on split cards). Double down is allowed on any two cards, even after a split. Player automatically wins if 8 cards are drawn without going bust. Insurance bets are available. There is no option to surrender. The minimum bet is €/£1, and the highest allowed initial bet is €/£1000. Chips come in five denominations, from 1 to 500, to make it easy for you to bet exactly how much you want to wager. Blackjack pays out at 3:2; insurance bets pay at 2:1, and standard wins pay even money (1:1). All bets push on a tie. When Multi-Hand Blackjack loads up on your screen for the first time, you’ll know you are in for a treat. The game looks quite good, and it is clear that a lot of thought was put into the layout. Everything is clear and easy to see. There are visual touches like the chip tray and other parts of the table that are there to add realism to the game – they never distract from the gameplay. Overall, Multi-Hand Blackjack is a real joy to play. Why play one hand when you can play three? If the dealer busts, that means you will have 3 winning hands instead of just one! Of course the inverse is also true – a dealer blackjack will bet 3 of your hands instead of just one. In the end it might even itself out, but it’s certainly more fun this way! 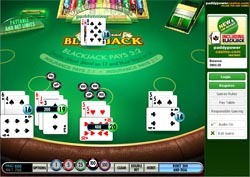 There are plenty of Multi-Hand Blackjack games on the internet, but this one really caught our attention. Maybe it was the graphics – nice animations, subtle realism, and not overdone. Or maybe it was the gameplay – smooth, easy to follow, and fun. Or perhaps it’s just because we did really well when we tried this game! But however we look at it, WagerWorks Multi-Hand Blackjack gets our top votes.